Let me paint a picture of pure joie de vie that will inspire you to fall in love with my sister Mary. She lives in Mary Land and is the creator of Mary Land, a place filled with light, laughter and joy. Mary lives there. That is how Mary has lived all of her life, in appreciation and happiness and fun. Joie de vie. The joy of life. Years ago Mary told me that every day when she woke up she said a prayer of thanks for all the blessings in her life and for all those she loved. Every day Mary starts the day with gratitude. Every night she goes to bed completely content. The glass is always half full for Mary. It’s just her nature. Positive. Grateful. Content. She has had difficulties in her life and was never defeated or defined by them. She looks to the light in everything and somehow is consistently guided to joy and everything working out for her. She lives in Mary Land. She created Mary Land. And she shares Mary Land with anyone who wants to visit. It’s a place I love to go and am always there when I am with Mary. Mary has an ease about her that is contagious and life affirming. She is busy, always moving and full of ideas and creativity. She gives from her heart freely. The shirt off her back, literally. I have loved some of her things and she has taken them off and given them to me. Most of my wardrobe is from Mary. And my jewelry, rugs, blankets, you name it. I live in her clothes and shoes and coats and scarves. I carry her purses and suit cases. I have her dishes. I also have her art and have made, way more than I can count, mosaics with her. My house is full of things we’ve made together and things she has made and given me. I’ve slept in many of her beds. I’ve vacationed in her homes with and without her. I’ve played with her children and grandchildren and have shared countless moments with her family. She has always included me and my family. She welcomes me always. Mary gives constantly and somehow is always abundant. She is never depleted. No matter how much Mary gives away she always has enough to share. Even when she and her family of five boys were young and struggling she gave freely. We have been close for most of our lives with a few hitches here and there. I have always admired Mary and, in many ways, tried to follow in her footsteps. I followed her to Lake Erie College for Women, which was nicknamed Lake College for Erie Women. And it was….. (I guess that makes both of us eerie women.) I used take a greyhound bus to visit her at LEC for the weekend when I was in high school. She always treated me with so much respect and integrated me with her friends. Even when I was younger Mary always included me with her friends. I am 6 years younger than Mary and remember being at some of her parties she had at our house. I was always welcome. That’s amazing. How many teenage sisters do that with a younger sister? I’ve tried to make my marriage and my family successful like Mary’s. She and her husband John have been married for 40 years and have one of the strongest relationships I’ve ever seen between two people. They raised five great boys who were born within seven years of each other. They are all grown and each have their own families. Each one of them is successful personally, in their marriages, and in their lives. They’re 6 for 6. The boys mirror the solid foundation their parents have and gave them. They are a solid family which Mary has created and continues to nurture every day through her daughters-in-law and grandchildren. They have a bond that grows deeper each day. I have read between 40 and 50 books on how to be happy and prosperous. I don’t think Mary has ever read one. It comes so naturally to her. She is living proof that gratitude and giving thanks brings more joy into one’s life. So often I wish I was more like her. Gratitude is one thing I can never get enough of. Here are a few of the many things Mary has taught me about love. I am worthy of being a friend in addition to a sister. Gratitude and giving thanks is more powerful than all the money in the world. Love is the strongest bond and force in the world and that creating a strong family is essential and life-giving. Giving is receiving and that being grateful gives us all grace. What honesty is and how to be true to my self and my convictions. By watching her stand up to our parents and speak her truth about what was in her heart and mind I slowly gained courage to do the same. Very slowly. How to stand for my convictions in the face of controversy and that I can stand on my own two feet. I am not, in any way, a worthless piece of @&)#. I didn’t know that for many years. How to be a great mother and how to create a family bond that is unbreakable. The most valuable lesson, my family must come first, everything else is second to that. How to laugh fully and with abandon at my self, at her, at the world and everything. Mary taught me how to experience joy. Now Mary has a mountain to climb. She has Leukemia. Chronic Lymphocytic Leukemia. She has known for several years and, like everything else in her life she seizes every moment of joy out of every single day by being with her grandchildren and family creating endless moments of joy. I know the continued climb will be filled with beauty and light that she will focus on amidst all the other sights. She will have the love of her family with her every step of the way. We are all by her side supporting her. My single prayer for you Mary is that you know your full goodness on this, your Birthday and each day forward. I hope you awakened today knowing how much you are loved and how important you are in this world. You have made, and continue to make, the world a better place for so many people just with your presence. You give with a wide open heart and a desire to seek what is good and life affirming. And you teach others how to do that as well. You taught me. I believe I learned from a master. I love you with every ounce of my being and am so grateful that we were born together in the same family. I have no idea who I would be without you. You gave me light, and faith, and courage and guts. When I wake up in the morning and before I go to sleep at night I count my blessings for you. Thank you for showing me the way to Mary Land and how to live my life there. Happy Birthday to a sister I love more than I could ever say. Wow!! What a wonderful tribute to your sister and best friend. I want to visit Mary Land too. I luv her joy and sense of humor, contagious! 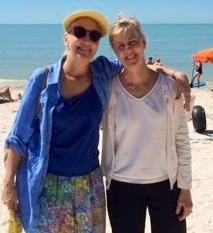 Melody, I am so very moved and touched by your beautiful and loving tribute to your sister, Mary, who is your gift. Thank you for sharing the journey of Mary Land. I felt the beauty and love of this wonderful place. She lives in a beautiful world and has openly and always invited me in. I am so glad you were touched by her. She is a gift.